Euphoria is the feeling that you will experience with the inspiring and heartening floral aroma of Geranium essential oil, used for uplifting the spirit, alleviating nervous tension, relieving off-putting memories and negative emotions. Extracted by steam distillation from the flowers and leaves of Pelargonium graveolens plant, Geranium essential oil is celebrated as an exceptional healing agent that helps in quickly repairing wounds, cuts and injuries including bone fractures. “Geranium is immune-system stimulating, firms and tightens tissue and is mood elevating”, says Bryan Miller and Light Miller in their book Ayurveda and Aromatherapy. Often used in improving the body’s ability to fight against illnesses, Geranium essential oil is used in Ayurvedic healing for stimulating the lymphatic system, assisting in menopausal and menstrual problems, relieving stress and for treating skin problems. Geranium is native to Egypt and is also believed to have been originated in the Reunion Island of the Indian Ocean. It slowly spread to Madagascar, South Africa, the Congo, Morocco, Central America, England, Italy, Spain, Russia, China, France and India. The best quality Geranium essential oil is said to be from the Reunion Island, which was previously called as Ile de Bourbon and so the finest essential oil from this island is known as Geranium Bourbon-La-Reunion. This plant was grown around homes in the ancient times to keep away from evil spirits. The traditional Africans used Geranium oil in the treatment of cholera and tumors. The Indian tribes in North America used Geranium tea prepared with its root powder to enhance the body’s immune power and treat ulcers and dysentery. The essential oil of Geranium is said to have first distilled from its leaves by the popular French chemist Recluz in the 17th century. His discovery was then supported by numerous research studies by many botanists and chemists, insisting the therapeutic use of Geranium essential oil. The leaves and flowers of this plant have also been used as a flavoring agent in teas, ice creams, cakes, jellies, sorbets, jams and salads. It has also been used in making perfumes and beauty products. According to the Gas chromatography report, Geranium oil constitutes of 20 chemical components that contribute to its fragrance, therapeutic attributes, consistency and quality of this oil. Of which, Citronellol contributes to the highest proportion of Geranium oil with about 35.0% of its total composition. I trust that this must certainly help you in getting to know the exclusive information about the prime chemical constituents of Geranium oil. The table crafted below clearly depicts the unique nature and contributions of these bio-chemical constituents to the healing magnificence of Geranium essential oil. The remedial properties of this oil are antiseptic, anti-infectious, antibacterial, astringent, antimicrobial, cicatrisant, haemostatic, vulnerary, deodorant, cytophylactic, tonic, styptic, vermifuge, diuretic and immune-stimulant. Ayurveda means the ‘knowledge of life’ and is a science of Mother Nature, which strongly states that Nature has all the cure in itself and illnesses occur where there is a lack of rhythm with nature. Health is a three-fold structure in Ayurveda, which states that perfect health is not just the nonexistence of diseases but the absolute balance of the mind, body and spirit. Ayurvedic healing does not practice the ‘one size fits all’ methodology as it trusts that every individual is a unique part of nature with a distinctive combination of the five elements of nature, namely fire, water, earth, air and space, where earth is the physical body (muscles and bones), water is the blood, air is what we breathe, fire is the heat generated in our body for metabolism, absorption and body temperature and space is the spirit that dwells in. Every human being is created with a unique individual constitution comprising of three biological energies known as doshas, which are nothing but a combination of the five elements of nature. Vata dosha is a combination of air and space and is accountable for movements, nervous functions and respiration. Pitta is a combination of fire and water and is in charge of digestion, absorption, excretion and body temperature. Kapha dosha is an arrangement of water and earth and is responsible for structure of the body, cellular nourishment and lubrication of all the parts of body. Ayurvedic texts state that every individual has a predominance of anyone of these doshas http://ayurvedicoils.com/wp-admin/post.php?post=1316&action=editthat determines their character and personality. It also says that illnesses occur when there is a lack of balance between these three doshas. When it comes to treatment, Ayurveda prescribes natural remedies including herbs, essential oils, physical exercises, healthy lifestyle, Ayurvedic routine, yoga, prayers and meditation, according to the unique individual constitution of a person in such a way that it corrects the doshic imbalances. Geranium oil has the power to pacify aggravated vata, pitta and kapha doshas. Geranium essential oil is a historic remedy for treating numerous skin problems ranging from pimples to scars. It works wonders on the skin mainly because of the fact that it exceptionally suits all types of skin. The antiseptic and antimicrobial properties of Geranium oil heal and act as a shield to the skin mainly from the hazardous effects of acne. Using 2 drops of this oil in your face wash, skin cream, lotion or in face packs can assist in cleansing the skin thoroughly, regularizing the secretion of sebum and retains the natural oil and moisture content of the skin. By this way, it prevents the formation of pimples, black heads and boils. Geranium oil is also effective in treating cellulite, eczema, dandruff and fungal infections like athlete’s foot and ringworm. The major cause for those ugly scars on your facial skin or on any part of the body is due to lack of blood circulation leading to stagnation of toxic substances and dead skin cells that block the even circulation of melanin causing scars and marks to stay on the skin forever. Geranium essential oil has cicatrisant and cytophylactic properties that promote blood circulation, assist proper distribution of melanin pigments, support the regeneration of dead skin cells and speeding up the growth of new skin cells. Massaging the affected areas with 2 drops of Geranium oil blended with 1 ml of olive oil or in your regular skin care cream can be of great help in fading away your scars and bringing out the natural glow like never before. Traditionally known as ‘women’s oil’, Geranium essential oil helps in treating feminine problems like excessive menstrual flow, vaginal infections and discharges during menopause. Massaging your lower abdomen and back with 4 drops of Geranium essential oil mixed with 2 ml sesame oil helps in treating painful menstruation, excessive bleeding, mood fluctuations, fatigue and anxiety during menses and menopause. Geranium oil has haemostatic properties that speed up the process of blood clotting and helps in controlling excess bleeding. It’s calming, soothing, tonic and stimulant properties relieves pain, stress and mood fluctuations during these ‘M&M’ times. Many recent studies have proved that Geranium essential oil stimulates the adrenal cortex, which helps in balancing the mind and grants the endurance to handle stress. The invigorating floral fragrance along with a touch of refreshing mint aroma makes Geranium as an incomparable essential oil for alleviating stress, anxiety, fear, feelings of desertion, negative emotions, tension and agitation. Add 5 drops of Geranium oil to warm bathing water, followed by 2 drops added to your diffuser can help in relaxing your mind, soothing your nerves and reviving your senses. This also helps in promoting peaceful sleep at night. With its assenting effects on the mind, Geranium is also recommended as a suitable oil to be used during meditation as it is trusted to guide one’s mind in the right path without confusions. 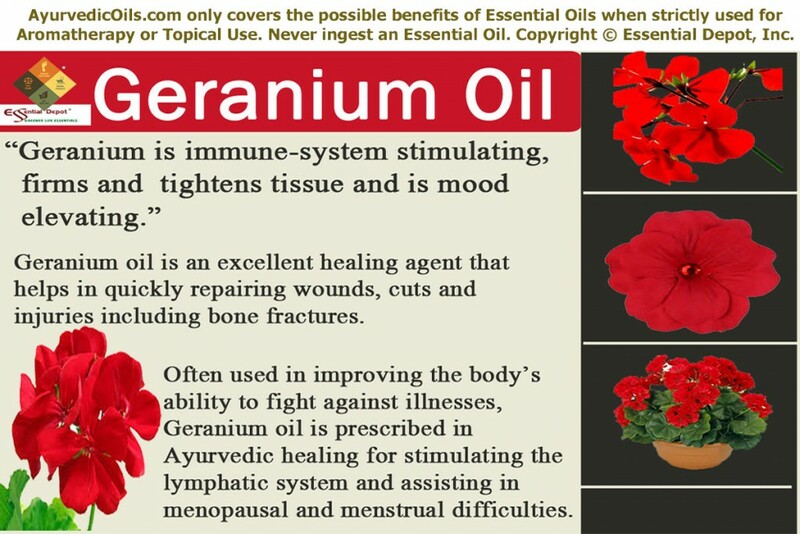 Geranium essential oil is one among the classic natural remedies for healing wounds and injuries including fractures. It is also effective in treating hemorrhoids and is used as an important ingredient in herbal formulations for hemorrhoids treatment. Applying 2 drops of Geranium essential oil mixed with 1 ml of coconut on the affected area aids in cleaning the wounds with its antiseptic and disinfectant properties, arrest the growth of infectious microbes and bacteria that may cause the wound to turn septic, speeds up the process of healing with its vulnerary properties, stimulates quick coagulation and blood clotting with its haemostatic properties. A 2012 study on ‘Antibacterial activity and composition of essential oils from Pelargonium graveolens L’Her and Vitex agnus-castus L’ by the Isfahan University of Medical Sciences have stated that the essential oil of Pelargonium graveolens is active against all of the studied bacteria and the presence of β-citronellol in this volatile oil along with its possible synergistic effect with other constituents are accountable for its antibacterial effects. Accumulation of toxic substances, which are the remains of indigestion and improper metabolic functions, is the root cause lying behind numerous illnesses. These harmful remains are known as ‘ama’ in Ayurveda and numerous Ayurvedic texts state that the amassing of ama in human body can even lead to chronic illnesses. Geranium essential oil is a natural diuretic agent that promotes the flow of urine and increases the frequency of urination, through which the toxic substances, excess salts and water in the body are eliminated easily. This aids in stabilizing blood pressure, improving the proper functioning of the system, relieving swollen ankles, reducing inflammation, lessening rheumatic and arthritic pain due to toxic buildup and gradually treating obesity due to fluid retention. Mix 5 drops of Geranium oil in 2.5 ml of almond oil and massage it gently for discharging the harmful substances in the system. The essential oil of Geranium has enormous tonic properties that strengthens the system, enhances the immune power and stimulates the proper functioning of all the parts of the body. Using Geranium essential oil in bathing water or steam inhalation or massage or in diffuser has positive effects on the digestive system, nervous system, endocrine system, respiratory system and circulatory system. Massaging your body with 10 drops of Geranium oil blended with 5 ml jojoba oil or adding 5 drops of this oil to warm bathing water can assist in stimulating the adrenal glands, lymphatic system, upholding the natural balance of hormones, increasing the immunity and augmenting the body’s natural resistance to fight against illnesses. Geranium oil is an excellent natural deodorant with its antibacterial properties that combat body odor and its floral fragrance that keeps one fresh all day long. 2 to 4 drops of this oil added to your diffuser can disinfect impure air, repel mosquitoes and other insects. 2 drops of Geranium oil added to steam inhalation can help relieve nasal congestion, tonsillitis and sore throat. This article is only for the purpose of information and is not meant to heal or substitute any professional medical advice or prescribed medication. Never use essential oils internally and always consider to use essential oils topically in a diluted form as pure and organic essential oils are highly concentrated liquids and may cause harmful effects if used straight on the skin. Geranium oil is non-sensitizing, non-toxic and non-irritant but it is good to be avoided during pregnancy. Consult your Ayurvedic physician before choosing the right essential oils for your unique individual constitution and state of health. The MSDS (Material Safety Data Sheet) of Geranium oil is readily available for your enhanced safety and better usage. 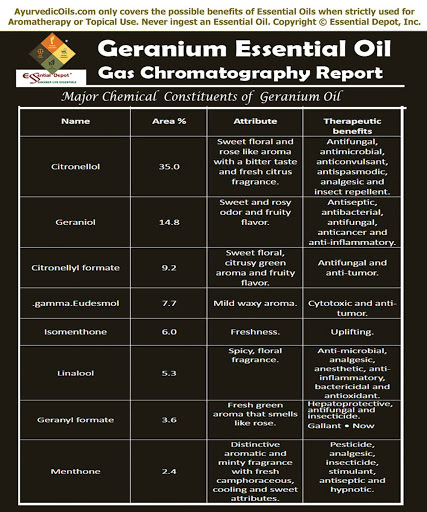 Gas Chromatography Report (GC analysis) of Geranium oil. In the midst of the 250 natural species and thousands of cultivars and hybrid varieties of the Pelargonium plant family, in the genus Geraniaceae and the most popular ones are Egyptian Geranium, Reunion or the Geranium Bourbon and the Moroccan varieties. Most of the varieties have a similar structure of chemical constituents with Citronellol and Geraniol being the prevalent components. Research reports reveal the skin irritating effect of Reunion Geranium oil in an undiluted manner; this oil was slightly irritating when tested on mouse skin; when tested with 5% Bourbon Geranium oil on 100 repeated dermatitis patients, the result was placid with two irritant reactions. It has also been proved that cosmetics with Geranium oil formula have caused dermatitis in hypersensitive individuals. Essential oils are recommended only for external use and never ingest essential oils as it can cause serious health hazards. Administering Geranium oil orally in studies has witnessed acute dermal LD50 in rabbits. This may also cause possible drug interactions with antidiabetic medicines and the enzyme, CYP2B6 inhibiting effect of geraniol causes drug interaction metabolized by CYP2B6. 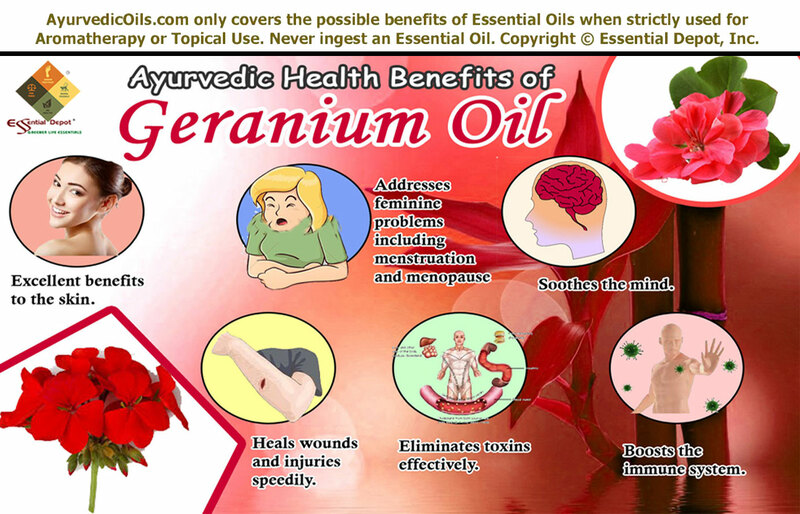 This entry was posted in Essential Oils - Learn About and Purchase and tagged Adverse effects of Geranium oil, Ayurvedic health benefits of Geranium oil, Ayurvedic oils for depression, Ayurvedic oils for eliminating toxins, Ayurvedic oils for fungal infections, Ayurvedic oils for haemorrhoids, Ayurvedic oils for immune power, Ayurvedic oils for insomnia, Ayurvedic oils for marks, Ayurvedic oils for menopausal symptoms, Ayurvedic oils for menstrual problems, Ayurvedic oils for mental strength, Ayurvedic oils for nail fungus, Ayurvedic oils for ringworm, Ayurvedic oils for scars, Ayurvedic oils for skin care, Ayurvedic oils for stress, Chemical constituents of Geranium oil, Gas Chromatography report of Geranium oil, Geranium oil in Ayurveda, Greener life Diamond Bio-Healthy Score of Geranium oil, Health benefits of Geranium essential oil, MSDS report of Geranium oil, Pelargonium, Pelargonium graveolens, Possible skin issues of Geranium oil, Safety data sheet of Geranium oil, Therapeutic properties of Geranium oil by AyurvedicOils. Bookmark the permalink.